These lovelies are like the moistest chocolate banana peanut butter muffers that ever walked God’s green earth. I mean truly, to achieve this level of unparalleled moistest (my sincerest apologize to the 99% of you who abhor that word) with ZERO oil involved is not to be believed. Perhaps we can blame the ripe nanners (mine were almost black) or the cashew milk, but regardless of the cause, I wholeheartedly promise that this recipe become a new family fave in no time. To be honest, I’ve been making these muffins every single week for about two months now. Originally I made them for my boyf because he loves having lots of snack for the week. Then I realized how amazing they were so I started to whipping up my own. 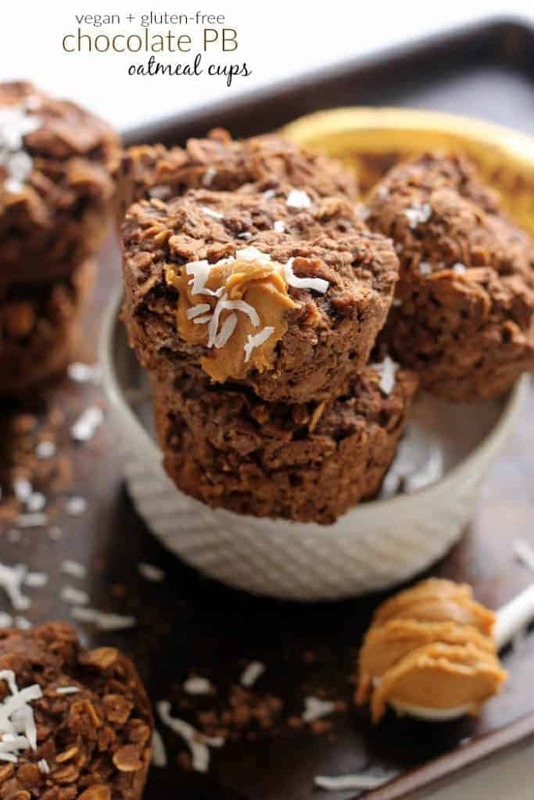 I basically took my Lemon Coconut Baked Oatmeal Cups, swapped out the lemon for extra milk, subbed almond butter for peanut butter, and added some cocoa and protein to make them more of a hearty snack. If you don’t want to use protein, just leave it out and use a couple tablespoons less milk! I tried baking batches at 375F for 20 minutes and then 350F for 25 minutes and I finally found that 350F is the key temperature. I also discovered that using chia seeds instead of flax helps them hold together even more. Regarding bananas, I use very, very over-ripe ones—about 3 1/2 medium bananas or 3 large ones. The best thing about these is that they’re so forgiving! I usually don’t even measure the peanut butter or cocoa. They’re also super low in sugar. Sugar is a fun friend, but if I can keep in on the low end, I’m a happy chickpea! 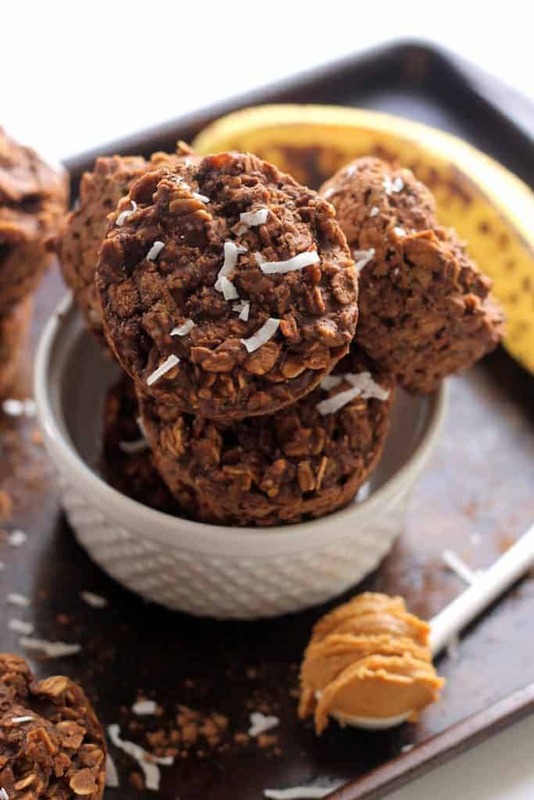 After making these a gazillion times, I’ve found that they’re perfectly sweet for my taste buds using very over-ripe bananas, about 15 drops of liquid stevia, and that scoop of Vega protein that’s also sweetened with stevia. Silk unsweetened almond or cashew milk are my go-to liquids of choice when it comes to baking and smoothies. You just can’t beat that creaminess! The cashew milk is definitely thicker and creamier if that’s your jam. I love that it has zero grams of sugar, is non-GMO, and is free of artificial colors and preservatives along with saturated fat and cholesterol. Perfecto! The more muffins, the merrier. That’s what I always say! 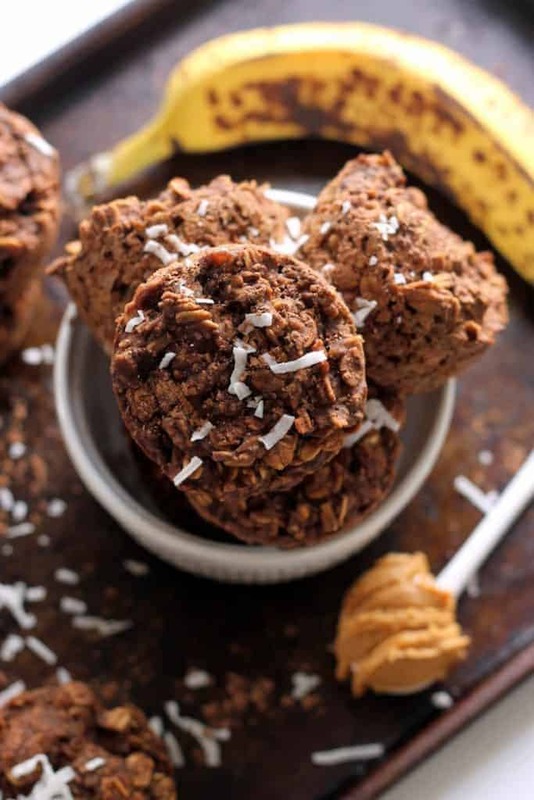 A delicious vegan and gluten-free breakfast or healthy snack on the go, these muffins are packed with flavor and nutrition from whole grain oats, plant protein, and creamy peanut butter! Place bananas in a large bowl and mash with fork. Add cashewmilk, peanut butter, optional maple syrup or stevia, and vanilla and stir until well mixed. Stir in chia eggs. Remove from oven and cool in pan on a wire rack. Once completely cool, store in an air-tight container in the refrigerator. This is a sponsored conversation written by me on behalf of Silk. The opinions and text are all mine. Thanks for supporting the brands that make Hummusapien possible! 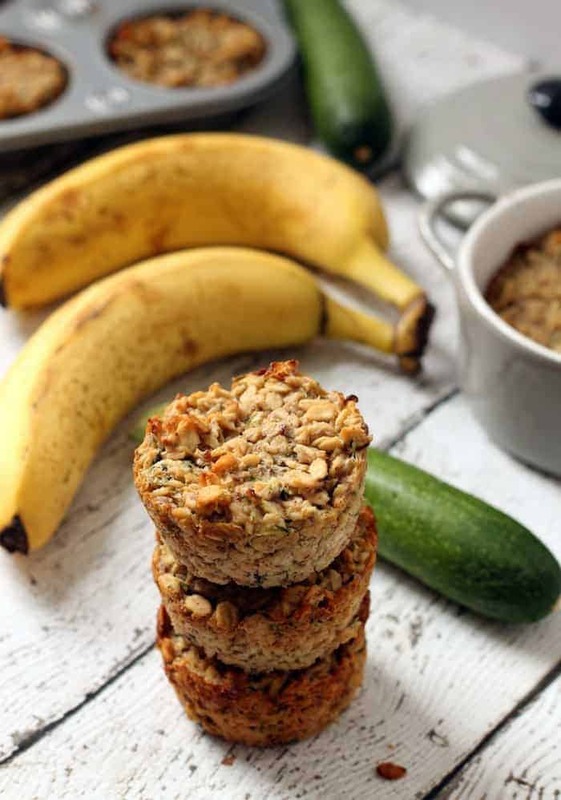 …and Lemon Coconut Baked Oatmeal Cups! Oatmeal muffins <3 They look delish! Good grief! I better not make these… I may not be able to eat oatmeal any other way again…! 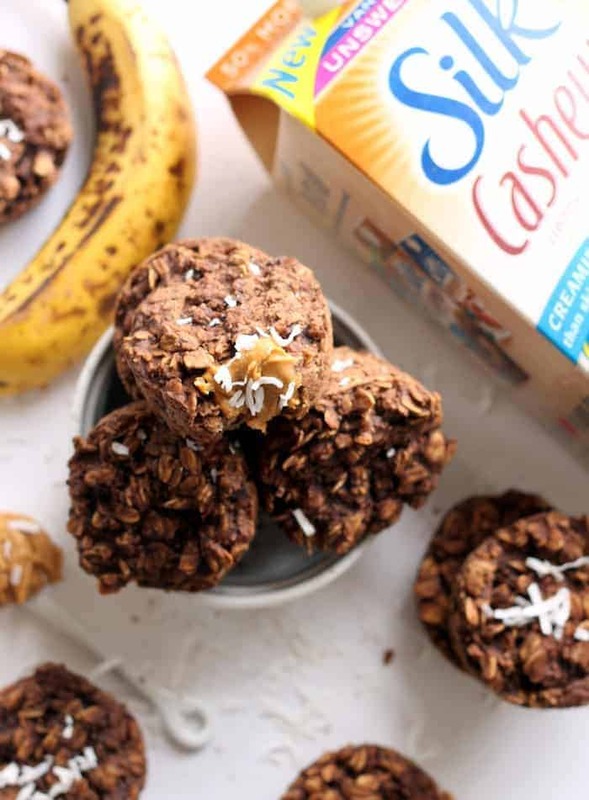 These little oatmeal cups are calling my name this morning! 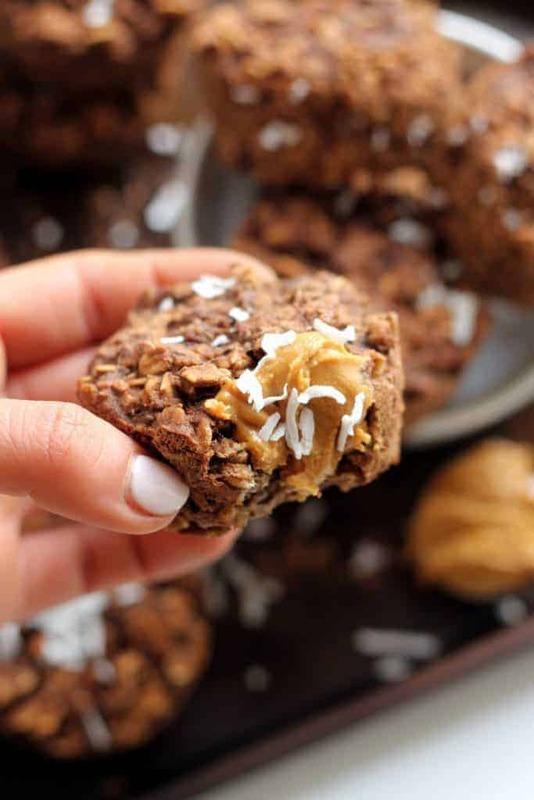 There is no better combo than chocolate and peanut butter and I adore that these have an extra protein punch! Bring on the moisture!!! I’m all about a moist muffin and the PB/Chocolate combo is driving me crazy here! I have the ripest bananas ever on my counter, so I am on top of these, you better believe it! I’m pretty sure I could live off of these. No oil?? No added sugar?? You have answered my breakfast/snack/everything prayers. What can I use in place of the protein powder? Can I just leave it out? These look amazing! Can’t wait to try them. These would be a great AM snack for when I’m craving something sweet and salty. Perfect combo! And love how instead of mixing the nut butter into the recipe it is clearly tasted through the dollop inside! These are totes making me drool! I love chocolate peanut butter anything and it’s a major bonus when it’s healthy and portable. I want them all in my face right NOW!! These look great! I am allergic to bananas so I need a good replacement. I have tried using sweet potatoes, unsweetened apple sauce and chia seed pudding, but they make everything too wet. Do you have any suggestions? Thanks. Hey there Sherry! Hmmm, I would’ve said sweet potatoes and apple sauce. Maybe add a bit more oats to counteract the moisture? Wow, these were so good…so good! These look great! Do they freeze well? Also, is there a good substitute for the protein powder? Yep, they do freeze well. I usually just put a frozen one in my lunch and it defrosts overnight. You can leave out the protein powder! You may need to cook them a couple minutes longer. Thanks for the great looking recipe! Q: Do you think it would work to sub an egg instead of the protein powder? Thx! Ooh the pics are misleading. Thought there was a PB filling in the middle. Still sound awesome regardless. These are fabulous! I do a lot of gf baking already, just to minimize wheat intake, but don’t do a lot vegan and needed something for a vegan-friendly brunch contribution. We ate ours on the car ride there (!) and they made everyone at brunch very excited and happy:-) Looking forward to making more of them soon and trying some of your other great variations. And looks like some other yummy recipe ideas here. Thanks! I need details before trying recipes. This sounds great but I need exact amounts. Since protein powders use different size scoops in their packaging; what amount is recommended for this recipe? Can you substitue honey for maple syrup? How much? Great, thanks for sharing this chocolate peanut butter protein cups. Will try this at home.